„Roam like at home”: how much do I pay for data roaming? Find the estimated FUP cap for the data volume you can consume while roaming in the in the EU/EEA using the application developed by ANCOM. The industry dedicated page contains all the information of interest for the providers of communications networks and services. ANCOM maintains a permanent contact with the industry and the consumers. Starting 15 May 2019, the tariffs for fixed and mobile calls to any country in the EEA will be capped at EUR 0.19 (VAT not included) per minute and EUR 0.06 per SMS. 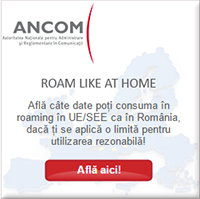 Comisia Europeană lansează un nou apel pentru finanțarea rețelelor de acces la internet de tip Wi-Fi "hotspot"
Romanians will continue to benefit from roaming at national rates in the UK and Gibraltar at least until12 April 2019.